I must say that Nigella Express is definitely living up to it's promise of good food fast. I cooked yet another dish from it's pages this evening - the Anglo-Asian Lamb Salad (page 6) and was very impressed with how lightning fast a great meal can be made. I think this took maybe 10-15 mins max and my husband and son pronounced it spectacular. (Carys doesn't do salad so she tucked into corn on the cob!) My son even requested that a little be left for him to spirit it away to pop in his sandwiches for lunch tomorrow (bless him, he knows how to make a mother feel chuffed!). My husband had jokingly warned that it had better be spectacular as I had rather rashly bought some lamb eye fillets, something I have NEVER done before, and after admonishing him for spending $32kg on turkey breast, his eyes nearly popped out of his head when I revealed that the lamb was $44kg!!!!!! I must say I was rather surprised at myself for buying them, I have always coveted lamb loin recipes as getting fresh lamb loin around here is so rare, and then when they are around they are hideously expensive. I think I had experienced a bit of head rush in the supermarket as they had whole fresh duck in as well and the ridiculous euphoria I experienced upon spying that, grabbing it and putting it in my trolley obviously escalated even more upon seeing the lamb loin! As soon as I saw this recipe I knew it was going to be a suitably impressive use of the lamb and of course it was. I am rather peeved with myself for not trusting Nigella's cooking times as I cooked them a little longer and they were definitely past pink (gutting I know, but they were still tasty and incredibly tender). The other fizzer was that the chillies I got were no where near hot enough, this dish can definitely do with the zing of chilli, which was there but not at the level that I think it should have been! Having tried the lamb loins I think I can safely go back to leg steaks which at less than half the price would definitely be a worthy substitute. But, if you have occasion to entertain (or just feel like eating well!) and want something gorgeous and impressive in next to no time, this is a stunner! Heat the oil in a heavy based pan and cook lamb for 5 mins on one side, then turn and cook for 2 mins on the other. Wrap meat in foil, making it a baggy but tightly sealed parcel, and let rest for 5 minutes. Mix dressing ingredients in a bowl. Open foil parcel and empty meat juices into dressing (I also deglazed the pan with some more rice wine vinegar and added that!). Cut the lamb in slices and add to dressing. 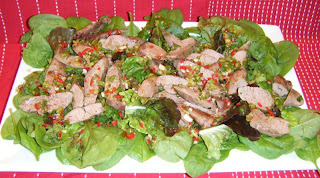 Scatter salad leaves on platter (or individual plates) and then arrange the soused lamb with dressing over top. Scatter the chopped mint on top and serve. 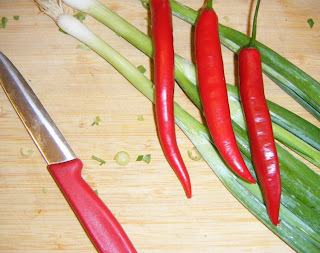 Serves 2 as a main course or 4 as a starter.